﻿ Villarreal 2-3 Real Madrid. A comeback to keep the lead! 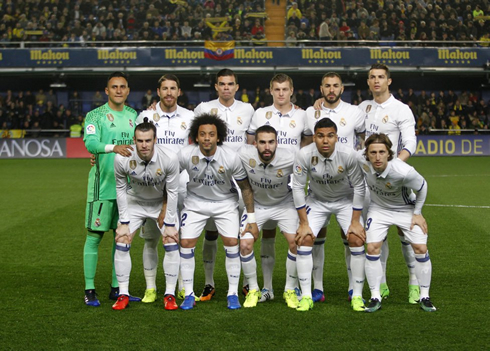 26.02.2017 » Villarreal 2-3 Real Madrid. A comeback to keep the lead! 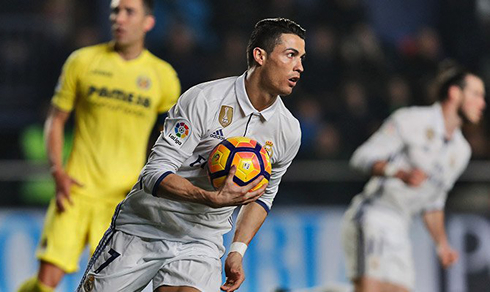 Real Madrid pulled off another fantastic comeback, this time against Villarreal in a game that ended with the Merengues beating the hosts 3-2. Bale, Cristiano Ronaldo and Morata secured 3 very important points for the European champions. What a match! At one point, it felt as though Real Madrid's classic midseason meltdown was on the cards, but it ended in spectacular fashion as the Merengues secured a 3-2 comeback victory over Villarreal. Today was a massive day for La Liga on the whole. With Barcelona taking on Atletico Madrid at the Calderon and Madrid away at El Madrigal, it shaped up to be a monumental one. And it certainly was. Messi's last-minute goal gave Barça a 2-1 victory putting all the pressure on Madrid to regain the lead in La Liga. Both teams started with some crisp precise passing, but before long Villarreal took full control of the match. In fact, Madrid were lucky not be down. Villarreal were secure they moved well in attack and Samu Castillejo, in particular, was a menace. Still, both teams would go into the half at 0-0. It would only take five minutes however for the tie to change. Castillejo, proving he's just as much of a menace with his head as he is with his feet, nodded a cross back to Miguel Trigueros, who buried his half-volley past Navas. Madrid were 1-0 down. Before the Merengues could even begin to muster a response, they were down 2-0. And it was Cedric Bakambu faul time this around, who is always a menace against Los Blancos. Latching onto a ball from Bruno Soriano, the Congolese international calmly slotted his shot past Navas. But then Zidane brought on Isco for Casemiro in a move that would change the match. Playing at the top of the diamond, he provided something different in the midfield, completely changing the way Madrid played in attack. And the comeback was on. The first would come courtesy of Gareth Bale. Scoring his second goal since his return, he latched onto a well hit Dani Carvajal cross, burying the header into the back of the net. The second goal would be a bit controversial, as Bruno was adjudged to have handled the ball in the box. It was unintentional, but the referee deemed his hand to be too high and pointed to the spot. Ronaldo left no doubt burying the penalty into the back of the net. And the third would come in the 83rd minute, courtesy of supersub Alvaro Morata. A brilliant tackle in midfield by Isco led the ball to Toni Kroos. The German immediately found Ronaldo, who delayed his pass just a second before freeing Marcelo down the line. The Brazilian's cross met the head of Morata, who buried a powerful header past the keeper. 3-2 and Madrid were clear. What a relief. It was a nailbiter, but Madrid were able to persevere. It's the kind of victory the team needs as they attempt to win their first league title since 2012. 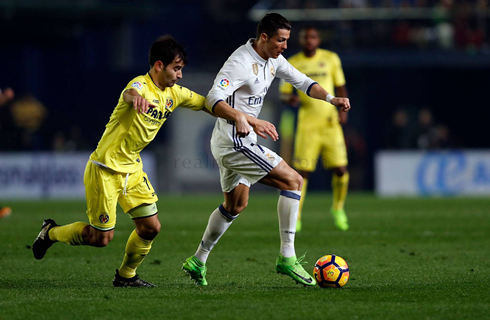 Cristiano Ronaldo next game is a La Liga fixture, on March 1 of 2017 against Villarreal. You can watch Juventus live stream, Villarreal vs Real Madrid, Barcelona vs Sporting Gijón, Leicester City vs Liverpool, Juventus vs Napoli, and Lotte vs Borussia Dortmund, all matches provided from our live soccer game pages.